You have a smoke detector in your home, and it may even be ‘smart,’ but it doesn’t actually detect fire like the Safer Alarms system we checked out at CES 2019. There’s a big difference between smoke and fire detectors, according to the CEO of the company with the same name. 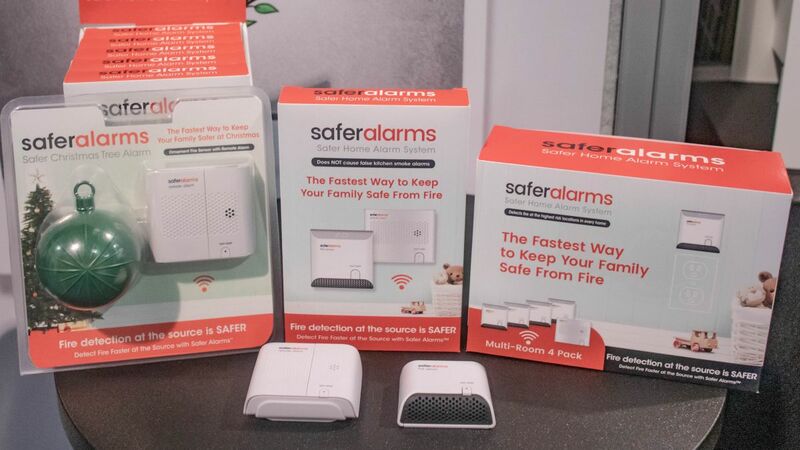 Safer Alarms, the product, starts shipping in late January and was buried in the South Hall of CES, in a small unassuming meeting room. Surrounded by booths touting copycat drones, it was a true hidden gem in the Las Vegas Convention Center. It consists of a heat detector and a companion alarm, and works by having you stick the heat detector in the highest-risk locations in your house: near a washer and dryer, furnace, humidifier, and anywhere in the kitchen or a baby’s bedroom. Once the temperature hits “the danger zone” aka 150 degrees F (66 C), the sensor wirelessly transmits a signal to the companion alarm located in a safe location. That’s the patent pending technology that makes Safer Alarms an intriguing product. “For the first time, our product allows the consumer to place this sensor in harm’s way, right where fires begin,” said Toland, who came prepared with two specific examples in his own life that anyone could relate to. “I’ve got an 11-year-old kid,” he said. “When she has her friends over and they have a power strip with every charger you can ever imagine plugged into it, it gets hot. So when this reaches the danger zone, and there’s an event – a fire – I’ve got it immediately.” He noted that a signal is wirelessly sent to the remote alarm, which is in a safe traditional location. Did you know you shouldn’t stick a smoke alarm in a laundry room, even though there are 10,000 dryer fires every year in the US alone? The Smart Alarms CEO promises that his remotely-located alarm transmits a signal before the sensor melts and, even when it does, he says “we’re still screaming as it goes.” It also solves the problem of humidity created by washers and dryers, which doesn’t affect a heat sensor like it can a smoke alarm. The Smart Alarms CEO believes his idea also tackles false detections that leave many smoke detectors uninstalled in critical areas, like kitchens. Smart Alarms has three products shipping in late January, and showed us all three. The 1:1 heat detector and a companion alarm costs $69.99, while the 4:1 package with four heat detectors and a companion alarm costs $149.99. Toland, who has a Wall Street background, called this “the deal of the century.” No international pricing or release date has been announced, as Safer Alarms is just getting started in the US. You’re three times more likely to have fire during Christmas, so Safer Alarms also has a clever Christmas tree heat sensor shaped like a Christmas ball. It’s meant to blend into your tree and ornaments with its evergreen green color, and gave Toland the chance to say, “Christmas trees tend to go up, well, like Christmas trees.” This sensor is priced at $69.99 and comes with its own companion alarm. At CES, the Smart Alarms CEO was pitching to nationwide retailers, though he didn’t want to publicly share which at this point. You’ll recognize the names, though. He did also talk up a next-generation product when we asked if it could communicate with a smartphone one day. It’s not a question of will Smart Alarms sell. If it works as advertised, it may be: will Toland sell? The idea is already catching the attention of insurance companies. The big story at CES 2019 has been the expansion of smart home gadgets, with Apple, Google, and Amazon leading the way. When we asked if he’d be interested in selling to one of these companies, it seemed to be a yes – with a caveat. Toland said he’d still be interested because it’s about more than money, it’s about market penetration for his life-saving product. “So yeah, I’m going to take the check, and yeah, I’m going to go away. Because what they can do is better than what I can do because they have billions of billions of dollars.